I got this body in trade from andrewaward. 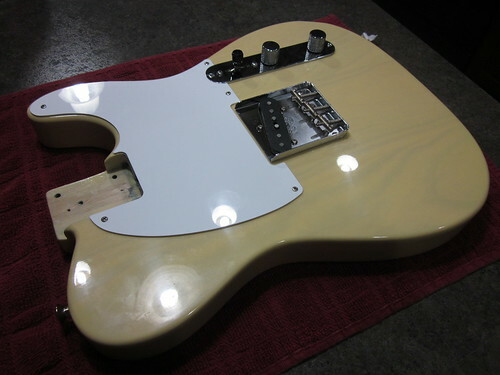 He says it is a 1971 or 72 Fender Telecaster body that has been refinished in a blonde paint. It is really well painted. Here are some pictures. 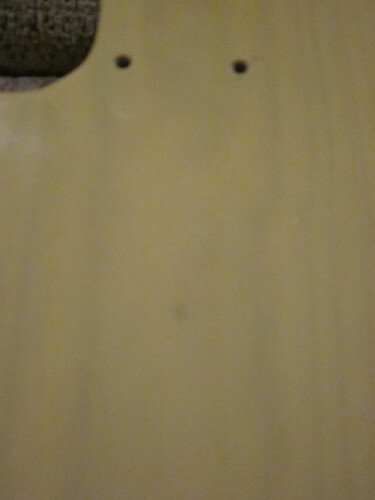 You can see the small filled holes from routing the body I believe? 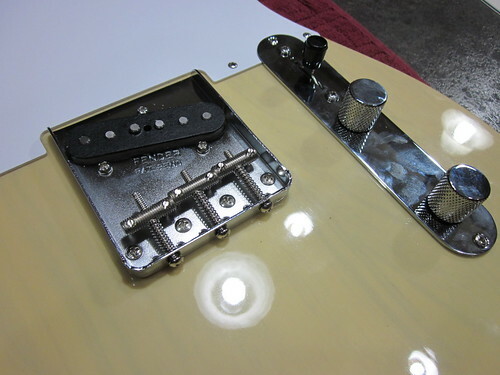 I have a bridge and pickup coming in as well as the control plate and such. I was going to put an electrostatic cup in, but the normal retainer is really stuck in there so I might just leave it alone and do it normal. 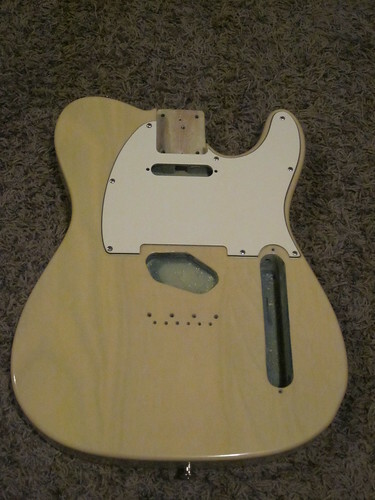 It is going to have an American Fender 61 bridge pickup and I am thinking of doing it Esquire style. 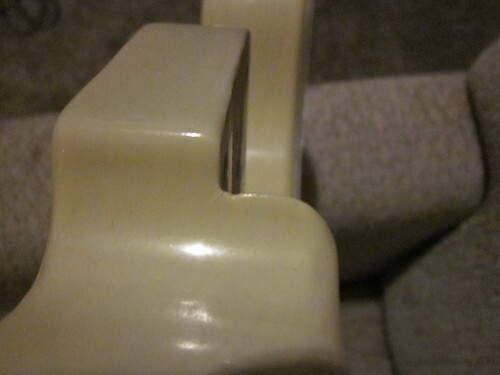 Oh it does have the neck pocket notch. I would have grabbed a picture, but I didn't know to look for it at first. That's nice. 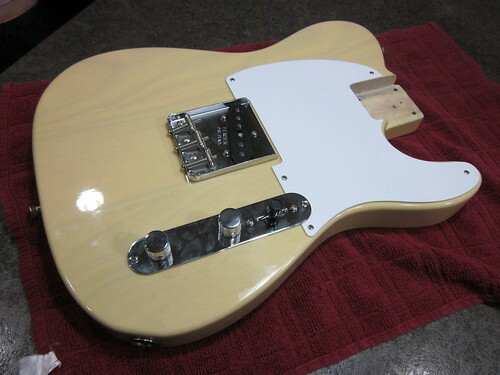 Love the finish! What you thinking for a neck? Edit for iPad typo. A ? Where a ! Was to be. 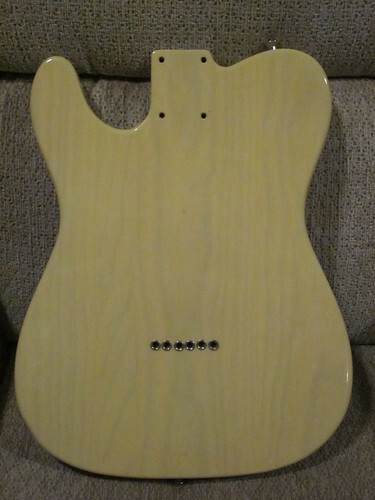 Maple is what I am looking for. 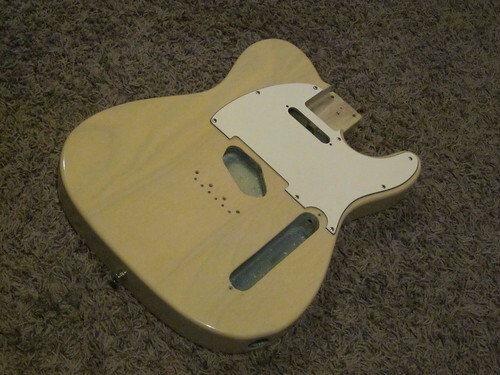 I ordered a white Esquire pickguard. The grain of that wood is lovely. Blonde finish was the way to go. Pretty cool. It came to me from Scotland. The places this must have been. 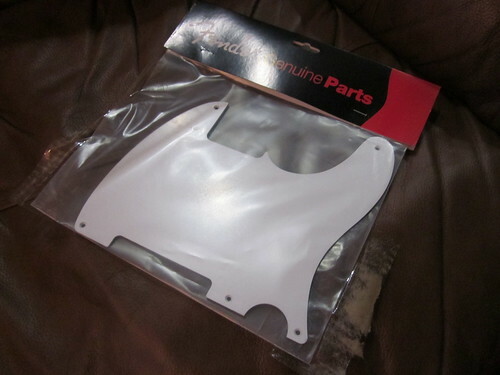 Pickguard came today. Looks good. 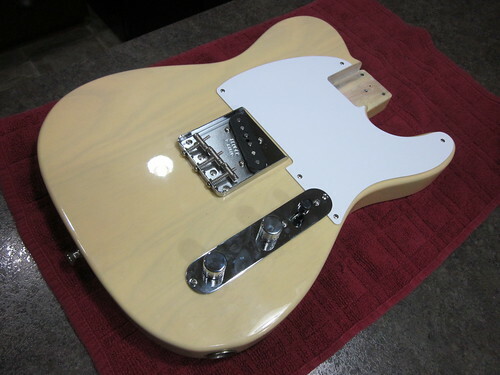 I love a nice telecaster. that body is too pretty, thanks for showing it off! 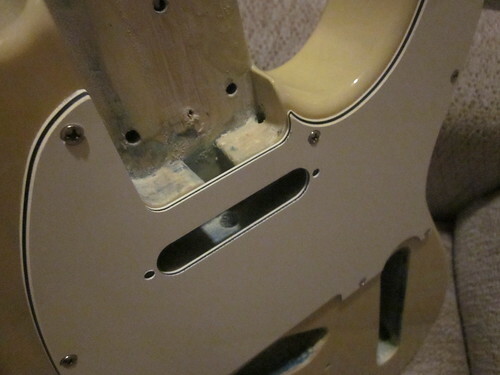 Ordered a vintage style Warmoth neck. 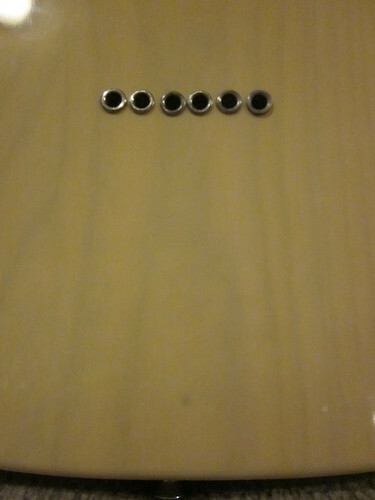 I had the frets done modern Fender style, 7.5 radius, Kluson hole size, standard thin contour, and satin tinted finish. I will have to work on making a decal for it. 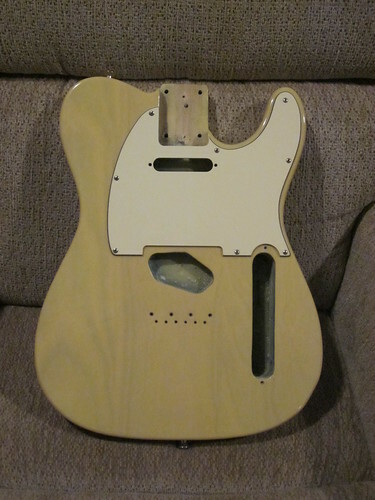 I might just use one of my Fender ones and cut off all the other details so it just says "Fender" like a nocaster. SWEET. Waiting on blonde paint my own self. Progress! Got most of the body parts in today. I am just missing the resistor and capacitors to finish the wiring. I am pretty happy with it. It looks really nice put together. 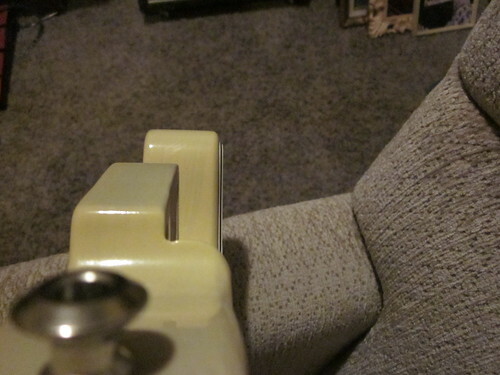 I also learned that strap button screws are the same as the ones used to mount the bridge. 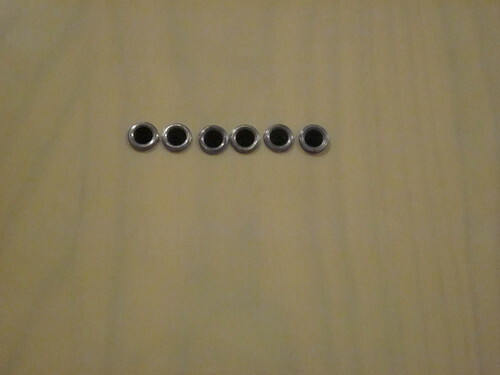 Yay for free extra screws. 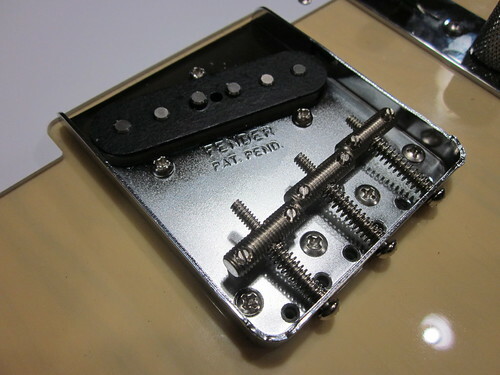 Oh and I read since the pickup has a metal plate on the bottom that is attached to the ground that it also grounds the bridge by screw contact. Is this correct? 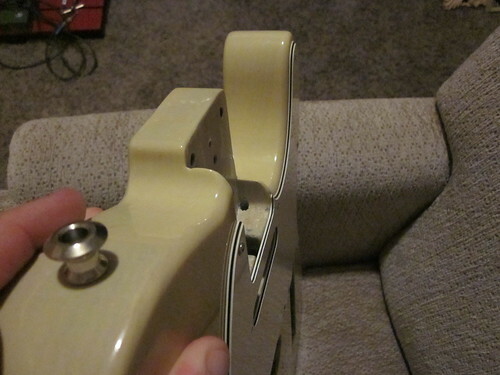 How are you going to wire it? Like an Esquire. 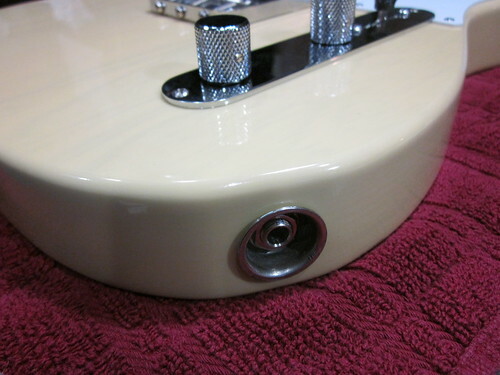 Bridge direction bypasses pots, middle is normal controls, and neck is treble cut.